We are experiencing a pullback in precious metals and mining stocks as investors react momentarily to a purported better than expected jobs report. It is reported that the unemployment rate increased despite adding 171,000 new jobs. The numbers look abysmal. However, the media reports that the economy is picking up and no more QE will be needed. Hence, precious metals are hammered. We have seen this before where investors are shaken out during corrections while the long term gold and silver players add more on pullbacks. 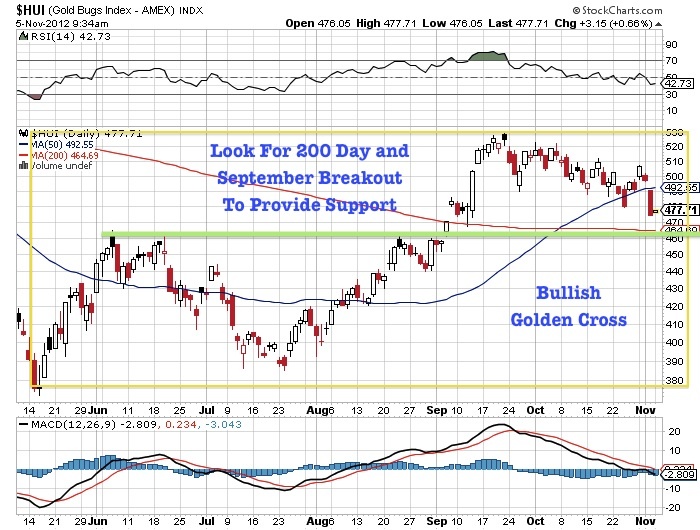 Now gold and silver are in correction mode and beginning to reach key reversal levels. Our readers know that there will be pullbacks to shakeout investors from the long term upward trend and a base may be formed to be able to regain the technical strength to break through all time highs. The U.S. will continue to keep interest rates at record lows to pay down skyrocketing debts. This will devalue the dollar causing a long term inflation which will continue to cause the value of gold and silver to be the ultimate safe haven at this time. 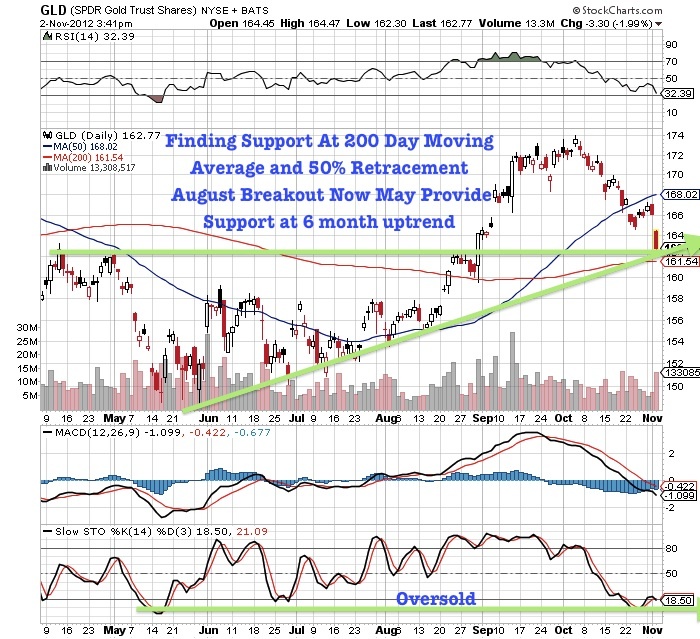 Precious metals are selling off and the weak hands may be shaken out soon as we reach oversold levels. Investors may be misdirected out of their core positions in precious metals and miners at at time when we may see a reversal and a move into new all time highs in gold and silver. 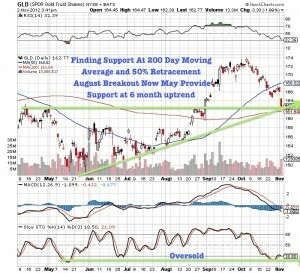 Gold (GLD) is the most oversold since May, where we saw a major reversal and eventual breakout in August on the open ended QE3 announcement. 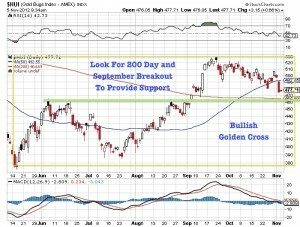 Notice now that gold has pulled back to that breakout area, its 50% retracement and six month uptrend. It is also pulling back to the 200 day moving average. This is a healthy and normal correction with an extremely strong technical support area. We may see a possible reversal and the strong hands regain control at these critical technical levels. We are once again going through a time for testing of our essential position in wealth in the earth equities. Investors are experiencing pain at a time that it is easy to throw in the towel and run to the sidelines in the form of cash and treasuries. For many of my readers we know this could be a snare exactly at the wrong time. We have Central Banks all over the world devaluing currencies through quantitative easing, the Fiscal Cliff is around the corner which could mean another credit downgrades and don’t forget about nuclear Iran. These are all fundamental forces which could send not only oil and gold higher but silver soaring. 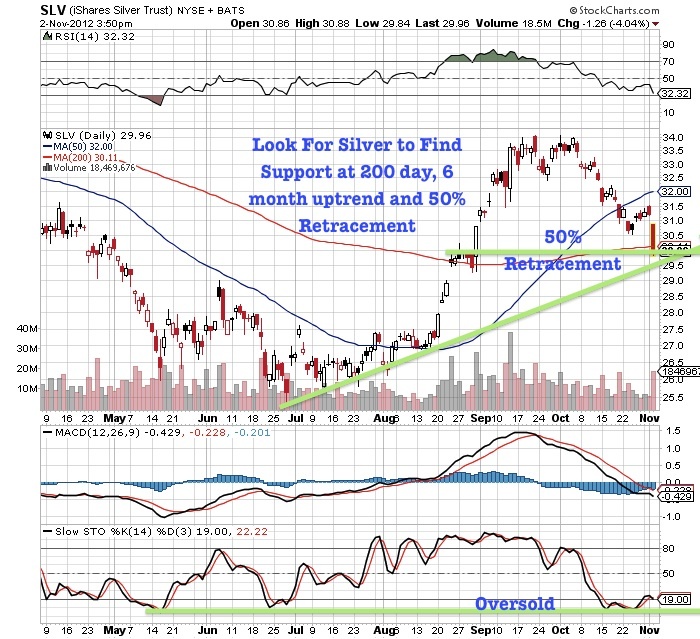 Silver has made a 50% retracement of its July to October move and is the most oversold since the July reversal. 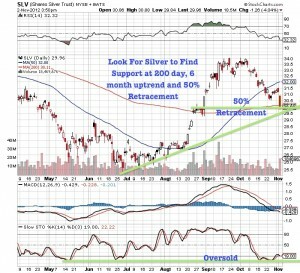 Silver looks like it is coming into major support at $30 at the 200 day moving average and rising uptrend. The demand for silver could rise rapidly as an alternative to fiat currency not only for American citizens, but in all the regions where currency debasement are taking place. Silver is one of the easiest alternatives for the common individual to diversify his holdings away from fiat currency as it is more affordable and fungible than gold. Also gold is currently overvalued to silver according to the historic mean of the gold-silver ratio. Silver provides a cheap alternative for the working-middle class citizen. Look for $30 to be a strong base for the silver price. We reiterate, the markets are like a casino, where the House tries to discourage the majority of the players who go home empty handed, while a select few go home winners. We have learned that market makers look at the same charts that we do and use them to fake out investors only to put in important reversals at support areas. This is exactly what is happening now. Charts can serve to fake us out. The shorts are taking advantage of the low volume and uncertainty originating from Hurricane Sandy and the upcoming U.S. election. Remember politicians tend to make promises during campaigns which are forgotten as soon as the election is over. Not much will change in our view. Whoever is elected will be facing significant hurdles both economically and geopolitically. Many of the major players and banks in Manhattan have not yet returned to the market due to the Hurricane and Election. The volume is low at a time during which the next base is being established for eventual lift-offs into new highs possibly right after the vote. Remember, that the long range technical picture of the upward trajectory of wealth in the earth equities is still intact and undergoing a needed period of rest and rehabilitation in this ongoing long term upward cycle. We had a powerful move up-move this summer as an open ended QE3 was announced. Despite the recent myopic focus of investors from the jobs report, the world ignores major gold and silver swans such as the recently announced open ended QE3 and its impact on the U.S. dollar. We are deluged by global instabilities, fiscal cliffs and unsustainable sovereign debt. Public sentiment in the junior miners is at a record low. Some small explorers are selling at fractions of their true value. We may be far from a bubble in precious metals indicated by this negative sentiment in the sector. At the time of a bubble, junior mining equities would be selling at multiples of their true value. Instead, they currently represent fire-sale purchases as some great assets are being completely overlooked by the masses. The juniors continue to be bought by major players such as the emerging nations who are placing large bets on the long term upward trend in our chosen sectors of gold, silver, uranium and rare earths. Note China continues to purchase undervalued miners in North America and is opening banks to finance mine development. This was approved by our own Federal Reserve. The meaning of this activity is that this volatility in precious metals and mining equities while striking panic is just a test to shake us out. This is precisely a time not to be concerned. The more sophisticated buyers may be taking advantage of the situation to hold on and indeed add to positions for those who were not able to get in before this summer breakout. Remember, bull trends in gold and silver rise on walls of worry. Healthy pullbacks afford secondary opportunities. We may be basing and bottoming right now. A powerful reversal could occur after the election. In fact, the junior miners are outrageously oversold and represent a deeply discounted contrarian opportunity. Many of our readers were concerned by some brokers putting downgrades on the uranium miners. These bearish downgrades are lovely music to our ears. Remember these are the same banks which may be financing these companies at record lows. Is the same old game of smart money buying low when nobody wants it and selling it to the masses at record highs being played? There may be additional short selling for the period immediately ahead before the election. The negative sentiment and oversold conditions in precious metals and mining equities are the major ingredients for the coming reversal which could be a year end rally in precious metals and miners into new highs.